The dream of James Cameron is now a reality and on December 17th 2009, Australia was given the chance to experience his dream that took over 14 years to create with an unthinkable budget behind it. The movie in question is of course Avatar which is uses state of the art CGI to create a surreal, almost dreamlike experience about a race of aliens called the Na'vi. With that said, it was only four years ago that the technology was available to turn Cameron's story into a fully fledged film. Even though the movie is heavily abundant of CGI, Cameron and his team have created an unparalleled technological achievement that transcends the connection between realism and fiction and actually makes you care about these fictitious aliens known as the Na'vi. To compliment the vision of Cameron, Avatar was filmed in 3D but to truly understand the fulcrum and meaning behind the film, it really needs to be experienced in glorious IMAX which which may make your experience, one of the most memorable movies to date and for me, this was one of those moments. Match that with a strong cast of actors that include Sam Worthington (Terminator Salvation), Zoe Saldana (Star Trek 2009), Sigourney Weaver (Aliens), Stephen Lang (Gods & Generals), Michelle Rodriguez (The Fast and the Furious) and Giovanni Ribisi (Public Enemies) to name a few of the stars, Cameron has carefully crafted the perfect Hollywood blockbuster popcorn movie with brilliant actors and amazing CGI. The story of Avatar takes place in the far future, 2154 A.D. to be precise and mankind have truly conquered the stars, although they have left behind a dying planet. The main protagonist is Jake Sully (Sam Worthington), a former marine who has the lost the use of his legs and is hoping that his time away from Earth will allow him to save the money needed for an operation which will allow him to walk. To compound the situation, his twin brother Tommy has unfortunately died on the lush moon of Pandora, one of the scientists responsible for the mysterious Avatar program. The Avatar program revolves around genetically engineered Na'vi with human DNA who are then controlled via a mind link by humans as their consciousness resides inside these "Avatars". Although humans have the technology, the world of Pandora is steeped in danger, whether it's the hostile atmosphere that can kill a man in a few minutes or the dangerous inhabitants, it seems that Pandora is the last hope of mankind. For Jake, fate has shone brightly on him once again and he has been given the chance to walk and run again, through his Avatar. Of course, something is not right on Pandora and the main reason humans are here is because of a rare mineral that may solve the energy dilemma back on Earth itself. The human power on Pandora is led by a private corporation run by Parker Selfridge (Ribisi) and his gang of military mercenaries, with their leader, Colonel Miles Quaritch (Lang). Needless to say, most of the humans on this planet are quite unlikeable. Although Jake has been assigned to a pseudo science team of Avatars led by Dr. Augustine (Sigourney Weaver), their goal is to communicate and establish a relationship between both species. For Jake, he has darker motives, thanks to Colonel Quaritch that sees our reluctant hero infiltrating the tribal Na'vi. 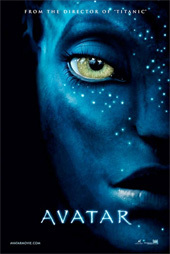 However through happenstance, Jack becomes caught up in the life of the Na'vi, thanks to Neytiri (Zoe Saldana), a female Na'vi who teaches him the spiritual and physical attributes of what it means to be one of them and his loyalties will be forever questioned. Without spoiling the movie, Cameron should be commended in making the viewer actually care for these CGI aliens who not only look quite lifelike but there is a strange attractiveness in their blue lithe-like appearance. The world of Pandora is also a wonderland of amazing creatures, mythology and boundaries that defy physics but this is what makes Avatar such a compelling and amazing experience is the powerful story that contains action, intrigue and romance. One cannot but help get drawn into this world which will leave you not only gobsmacked but craving for more. On the IMAX screen and more specifically in 3D, Avatar is as close as us mere mortals will get to experiencing an alien world thanks to the stunning CGI, perfect audio and crystal clear vision which is truly a sensory overload that I could not fault, one way or another. The naysayers may question certain parts of the story but if you go in with an open mind and forget about the real-world for 2 1/2 hours, you will be pleasantly surprised and also amazed.